Summer time, well July & August is an important rest time for me...usually. This year my summer has been full of teaching and experimenting. Both of which I love. 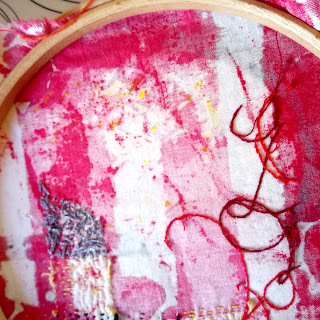 The experimentation has been all about mark making on fabric, learning new techniques and finding out about new materials. 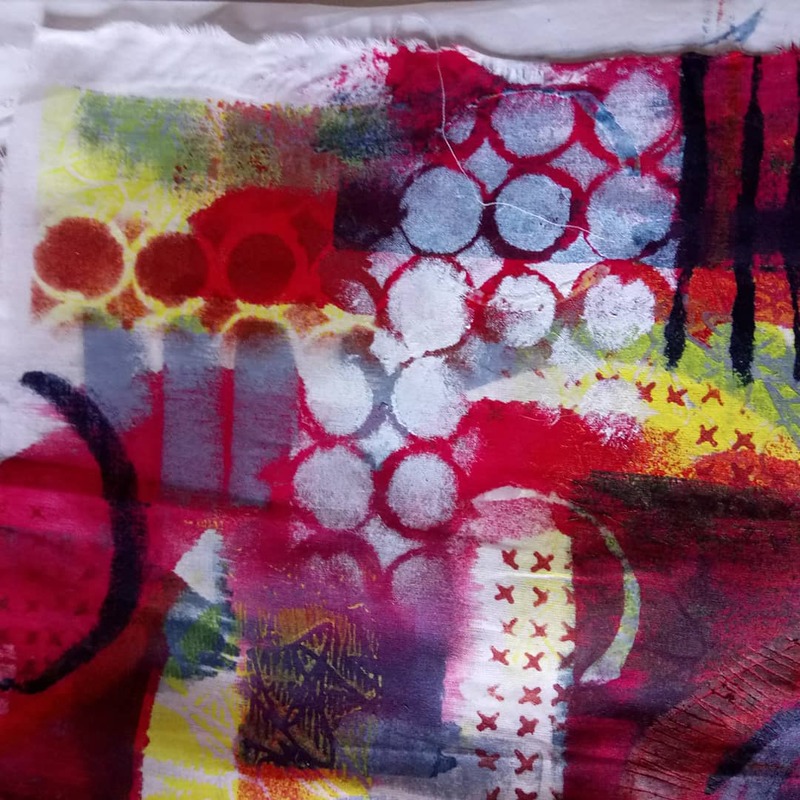 eco printing, yes it may be about textiles, but printmaking gets in there somewhere. I have been thrilled with the results, particularly on silk and have started to incorporate it into my work. More of that later in the post. Not satisfied with that I took myself off to an Art Van Go workshop at the Textile Bazaar in Much Marcle. 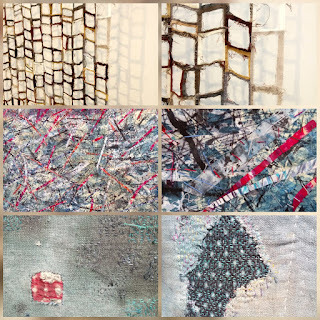 Entitled 'How Can I Resist' it was all about resistant marks on fabric. Whoops, look at all that colour, but such a reminder of all the materials that make a delicious resistant mark when washed with inks and fabric dyes. 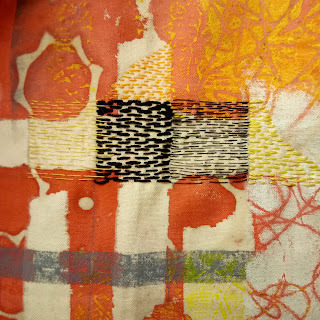 spending an excelent day with textile artist Catherine Kingzett, who egged me on. all my mixed media samples under went a layer of gum arabic transfer printing. Even the stitched piece, the gum arabic transfer covers all textures beautifully. What next in this summer of textile experimental frenzy? 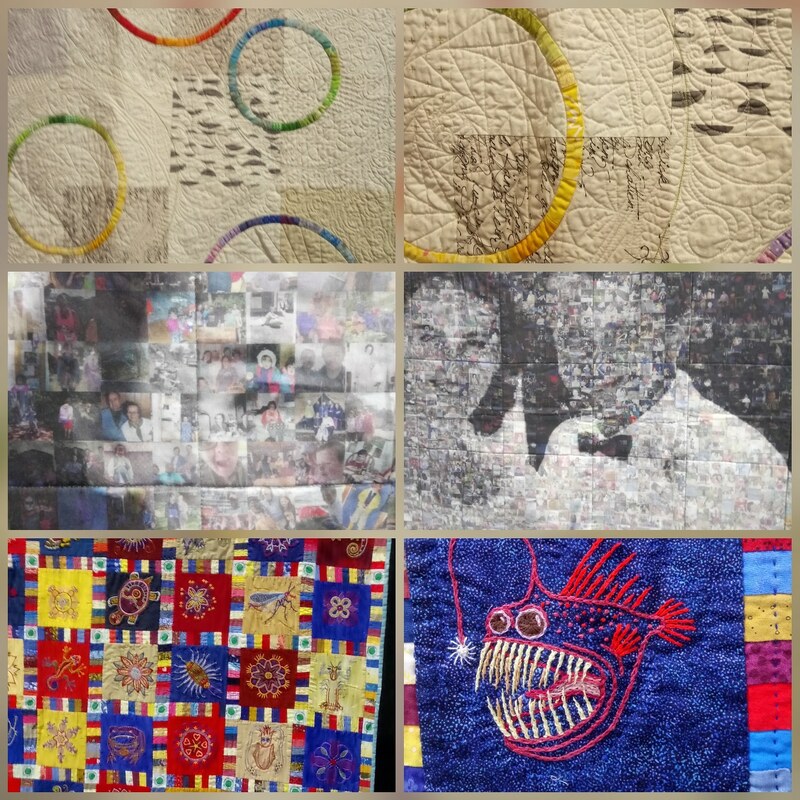 The Festival of Quilts of course held at the NEC. competition pieces using traditional and digital techniques. Art pieces breaking all the rules. Exquisite technique by the Japanese artist, Kuroha Shizuko. 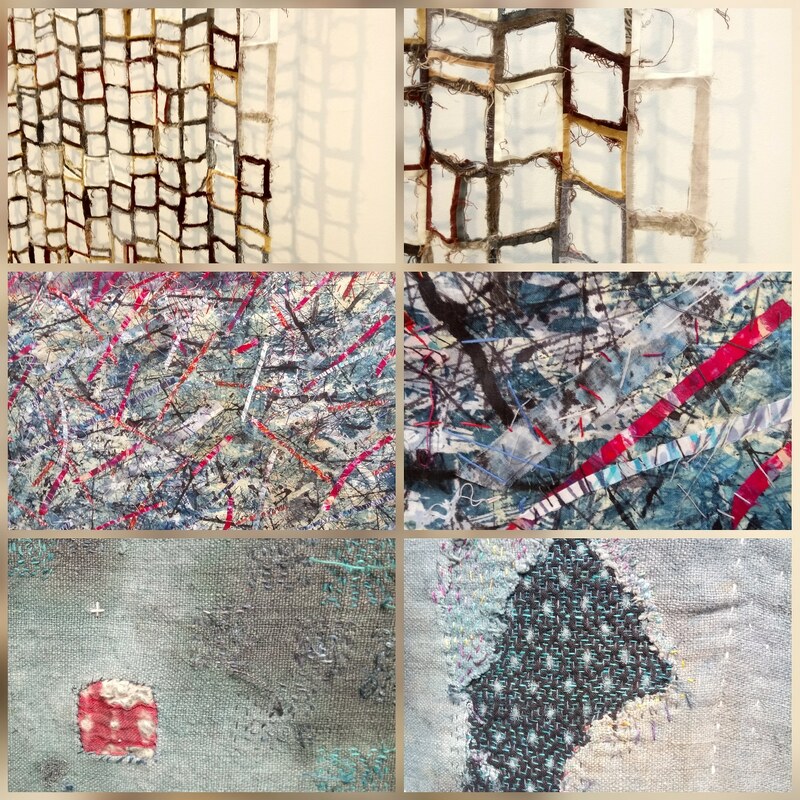 So now into August and I have a great deal to think about as far as textile techniques and resulting works are concerned. Lets face it paper is just another form of fibre substrate and the printmaking techniques onto fabric are similar to that on paper. To compound this theory I took myself off to Knebworth, to the headquarters of Art Van Go and participated in a monoprint onto fabric workshop. Look more colour, it is all very liberating being told what to do. 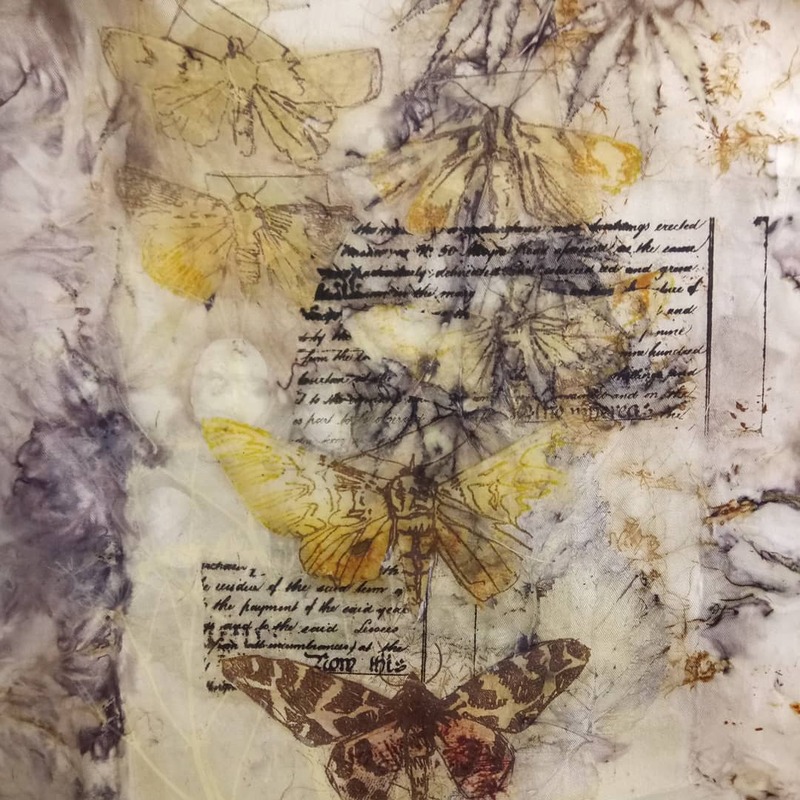 The revelation for me is the transfer monoprint line drawing, I know that is possible with paper and oil based ink, but I was thrilled to do it onto fabric with acrylic paint. Folding the piece into a pamphlet book, embellishing with puff binder and stitch finished off this sample. I am very happy with the result. Thank you Maria Boyle for introducing new materials to me. The biggest problem with being at Art Van Go is that it is exit through the gift shop!! I had a very enjoyable morning buying lots of things to experiment with as they have it all there in one place! So I came home with all the things I needed to experiment with breakdown screen printing...and then some. A day mixing Procion dyes. What I hear some of you say, I would never go down the dye route. But never say never. A day waiting for the breakdown screen to dry. Then a morning of experimental screen printing. Samples washed and drying, I now can't wait to experiment further. Back to the research part of this summer. This meant a trip to MAC, Birmingham to visit the exhibition Ctrl/Shift a project by the 62 Group of Textile Artists. Be quick this exhibition finishes on the 9 September. 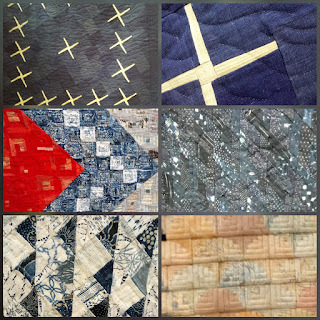 Very different to the Quilt Festival, I found the exhibition inspiring and supports the direction I may want to go if I develop my experiments further. But I have been putting some of this experimentation into practice in preparation for the group exhibition Into the Light. These silk prints will be showing with the group IN-sight at the Museum in the Park, Stroud. there will be a diverse response in a variety of printmaking techniques. Check the Museums website for workshops and events around the exhibition or keep an eye on my Facebook page Sue Brown@printsandenamel and Instagram sb.brown21 for up dates. WOW!! Amazing & beautiful work! Found u through A Mermaid's Tale blog list.